Reducing writing shame should be one of your goals if you ever suffer from this supremely uncomfortable and unhelpful emotion…. Are you proud of your ability to write? Or do you secretly feel embarrassed, worried or even ashamed about it? I ask these questions following my recent post about when you should consider reducing your writing goals. Hanging onto a goal that you’re not achieving only sets you up for repeated failure and self-disappointment. It’s undermining rather than helpful. After writing about reducing writing goals, I received an email from a reader who observed that whenever we compare ourselves to others — not just in writing but also in exercise, hobbies, earnings and just about anything else you can name — we tend to focus on the far right-hand end of the bell curve (see image, above). 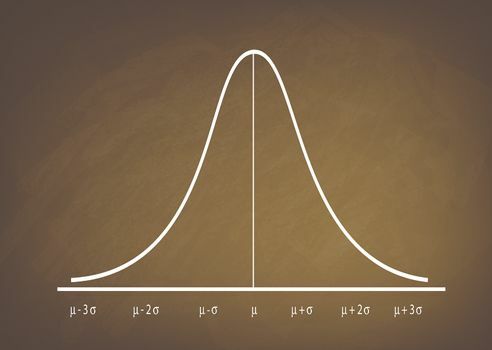 As a result, we often forget that the vast majority of people fall right in the middle — hence the name “bell curve.” Also, we totally ignore the left-hand end of the curve. Let me begin by defining shame. Generally, people feel guilty when they’ve done something wrong. Shame, however, is the feeling that we ourselves are wrong or bad for what we did or failed to do. It is deeper than guilt, and we use it to condemn not just our behaviour but our very selves. Even though shame is unhealthy, we have a hard time walking away from the feeling because — on some level — we believe it saves us. Second, we believe shame will help us maintain control. This is also incorrect because shame usually encourages us to continue doing the same behaviours that have caused the problem in the first place. Think about skipping your writing for a day. Is it easier or harder to resume writing the next day? Hint: It’s almost always harder because we’ve started to lose the automaticity (the ability to do things without occupying our minds with low-level details) that comes with ingrained habits. Third, shame causes us to believe the problem is all our own fault, and we assume that we just need to pick up our socks. Writing feels so individual and so personal that we have a hard time imagining that responsibility could rest with anyone else. But if you failed to play the French horn, for example, would you blame yourself? (Assuming you’ve never played the French horn before?) No, of course not! You’d understand the problem was that you’d never had any instruction. I know, I know, you’re going to tell me that you had plenty of writing instruction in school. But the vast majority of school-based writing instruction will have focused on spelling and grammar. Almost none of it will have addressed the issues relating to the behaviour and neuroscience that can make a massive difference to writers. But there’s an even more insidious problem with shame. Research has shown that it causes people to procrastinate to avoid it. 1-Focus on your breathing. Slow, deep breathing is inherently calming and will help keep shame away. Many of us suffer from what I like to call writing apnea, and this disorder predisposes us to shame because it puts our autonomic system into freak-out mode. If you want to get really serious about your breathing, then please consider meditating. It’s incredibly helpful, especially for writers. 2-Adopt a realistic attitude toward mistakes. We all make mistakes; it’s part of the human condition. But shame always tries to convince us that we should either ruminate endlessly on our failures, never forgiving ourselves for them, or forget about them entirely, as the only way to move forward. If you’re able to take a more realistic attitude — owning your failures, as well as your successes — you’re more likely to be able to hold shame at bay. Shame is a deep, insidious habit that can not only make you feel abysmal but also derail your writing. Take it seriously and don’t let it get its clutches on your psyche. I’ve rebuilt my Get It Done accountability program so that I can now accept new participants every month. If you are struggling with a book or a thesis/dissertation, consider how external support could help you succeed. To learn more (or to apply) go here. Application deadline is Sept. 26 if you want to start Oct. 1. My video podcast last week offered advice on how to make a business case for your book (Or see the transcript.) And consider subscribing to my YouTube channel. If you have a question about writing you’d like me to address, be sure to send it to me by email, Twitter or Skype and I’ll try to answer it in the podcast. Do you ever experience writing shame? How do you deal with it? We can all learn from each other so, please, share your thoughts with my readers and me in the “comments” section below. Anyone who comments on today’s post (or any others) by Sept. 30/18 will be put in a draw for a copy of the non-fiction book Enchantment by Guy Kawasaki. Please, scroll down to the comments, directly underneath the “related posts” links, below. Note that you don’t have to join the commenting software to post. See here to learn how to post as a guest.